In a neighborhood and borough on the edge because of gentrification, the fight continues and this time it’s taken a personal face against someone once seen as our hero. 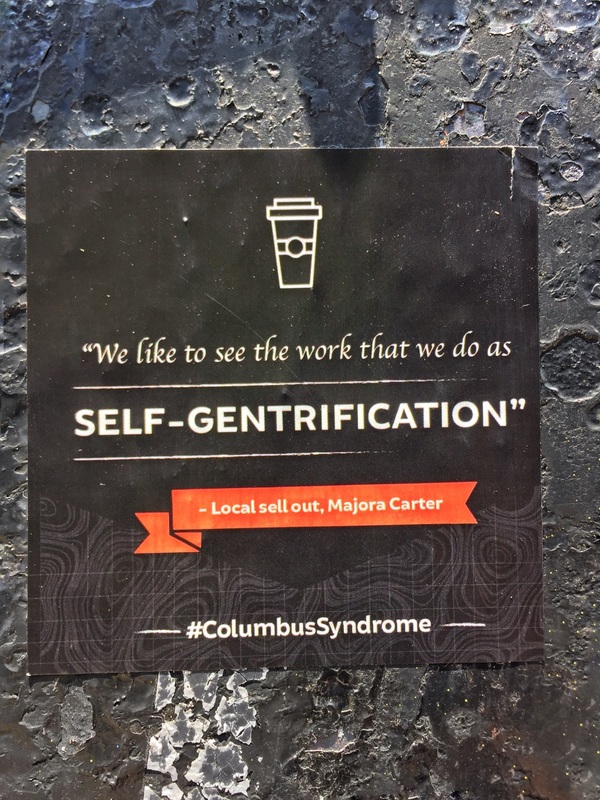 Someone has begun placing stickers calling Majora Carter a traitor and associating her with the hashtag #ColumbusSyndrome, a term that is often used when talking about gentrification and how people approach gentrifying areas with a colonizer’s mentality. Once upon a time in the Hunts Point neighborhood of The Bronx, she was a community leader who many, myself included, looked up to as a positive role model. Through her tenacity and ferocity at bringing attention to environmental injustice in Hunts Point, she quickly became an oft sought out voice by other leaders including giving TED Talks. But for the past four or five years Ms Carter began to seem more self involved and no longer truly helping the community—unless she was paid as was the case when we, as South Bronx Unite, reached out to help us fight against FreshDirect’s wanting to move to our waterfront bringing over a thousand trucks which would further exacerbate our above national average of asthma rates. We were shocked. Wasn’t this what Majora did? Didn’t she help fight for our communities? Little did we know that she was already being courted by FreshDirect and eventually paid her to convince Bronxites that this was a good thing when clearly it was an environmental disaster for our neighborhood and borough. Even the organization she founded, Sustainable South Bronx, and The Point, went against Majora along with over 50 community based organizations condemning the FreshDirect deal especially on the grounds of it being a poor environmental step backwards for the South Bronx. People, myself included saw that Majora Carter was no longer a friend but a traitor to our communities. The New York Times even wrote an article, ‘Hero of The Bronx Is Now Accused of Betraying It’. Ms. Carter’s meteoric rise also made her a polarizing figure. Many former allies and neighbors say that Ms. Carter trades on the credibility she built in the Bronx, while no longer representing its interests. They say she has capitalized on past good deeds in the way that politicians parlay their contacts into a lobbying career, or government regulators are hired by the companies they once covered. And that’s precisely what she’s doing now with the new Birch Coffee Shop in Hunts Point of which she is involved in. Rather than supporting our own local coffee entrepreneurs, she preferred to help bring in a company from Manhattan and Long Island City with no connections to our borough. Many residents have expressed concern and distaste of her actions and is often called and agent of gentrification. Which leads to the latest attack on her character. What us self-gentrification? It’s nonsense and just trying to whitewash what she’s doing to the community. People no longer are blind or enamored by those who betray our borough and people. We know when we’re being used and folks will not remain silent. It's Farmers Markets Season in The Bronx—An Interactive Guide!